For the first time there was constructed with this machine [locomotive engine] a self-acting mechanism in which the interplay of forces took shape transparently enough to discern the connection between the heat generated and the motion produced. The great puzzle of the vital force was also immediately solved for the physiologist in that it became evident that it is more than a mere poetic comparison when one conceives of the coal as the food of the locomotive and the combustion as the basis for its life. 'Leid und Freude in der Naturforschung', Die Gartenlaube (1870), 359. Trans. Kenneth L. Caneva, Robert Mayer and the Conservation of Energy (1993), 145. Genius is the whistle of the locomotive, which with steaming shrieks indicates its progress, but common sense is the driving-wheel which moves the train. In Igerne and Other Writings of Arthur Handly Marks (1897), 348. From 'Fuel', Lecture delivered to the British Association at Bradford, printed in Nature (25 Sep 1873), 8, 443. Great triumphs of engineering genius—the locomotive, the truss bridge, the steel rail— ... are rather invention than engineering proper. From The Economic Theory of the Location of Railways (1887, 1914), 1. It is sunlight in modified form which turns all the windmills and water wheels and the machinery which they drive. It is the energy derived from coal and petroleum (fossil sunlight) which propels our steam and gas engines, our locomotives and automobiles. 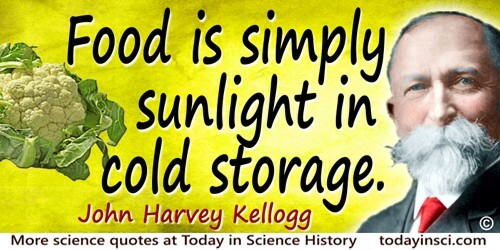 ... Food is simply sunlight in cold storage. In New Dietetics: What to Eat and How (1921), 29.